Tight credit conditions continue to persist in the Eurozone, inhibiting growth and dampening plans for fiscal consolidation. AP via Yahoo: - Another drop in lending to companies in the 17-country eurozone showed the economic downturn is deepening, as a brighter mood on financial markets fails to catch on with businesses. 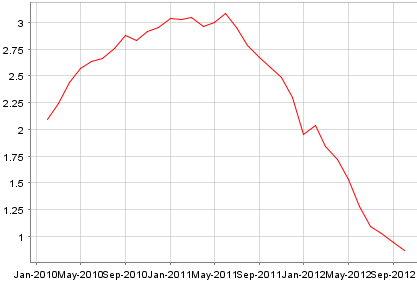 ... loan growth to companies is declining sharply as well. The stagnation in lending is in part due to banks deleveraging in order to improve capital ratios for Basel III. 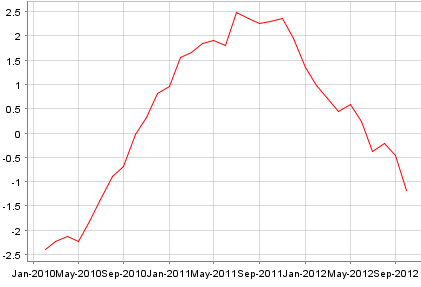 But a big part of the issue is simply lack of demand from borrowers. AP via Yahoo: - The numbers show the economy is struggling despite efforts by the central bank to stimulate credit and calm financial markets fearful that the eurozone might break up. The ECB has cut its main interest rate to a record low 0.75 percent and made €1 trillion ($1.3 trillion) in cheap loans to banks that don't have to be paid back for three years. Even so, that easy money is not making it from banks to businesses and consumers, largely because demand for credit remains weak. 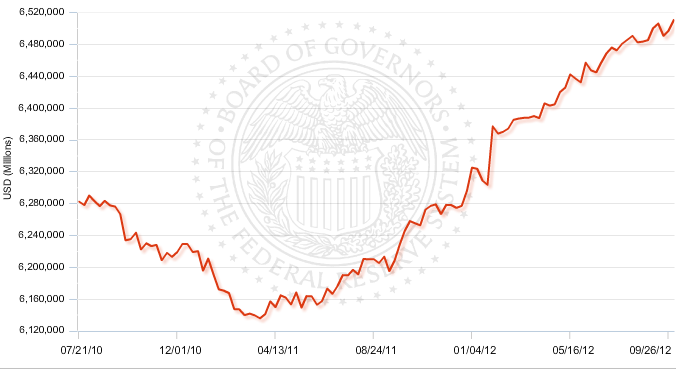 Businesses see no reason to borrow to invest in expanding production. Meanwhile, banks in some countries have less to lend because they are struggling to recover from losses on real estate loans that didn't get paid back and on government bonds that have fallen in value due to fears about those governments' finances. Liquidity is trapped in the Eurozone core where businesses are borrowing less, while periphery banks have limited liquidity even if there was demand. 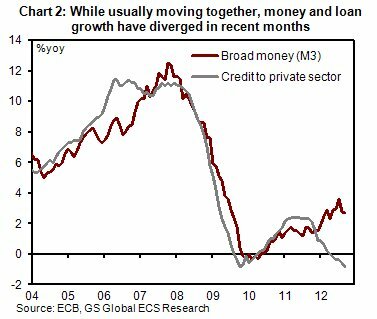 Either way, liquidity provided by the ECB is not making it into the private sector, as the growth in money supply diverges materially from growth in lending to the private sector. Note that this weakness in credit growth in the Eurozone is in stark contrast with the US, where banks continue to lend at a steady pace. 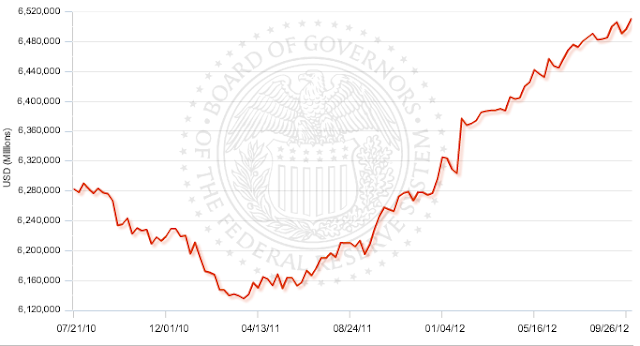 This trend started in early 2011 (driven mostly by corporate lending) and seems to be ongoing.